Let’s take a step back and reflect on 2017. Whether this year brought some tougher challenges, joyful celebrations, sweet victories or all the above, this is a great time to ponder the year as a whole and move forward with hope and anticipation for the new year. Consequently, whether or not you are a resolution-maker, it is always a good time to define a goal and work toward it. One way to get started with setting attainable and meaningful goals is by meeting with a wellness coach. What’s great about this is that it can be any kind of goal related to your well-being as an individual; it can be an attitude adjustment, a fitness goal, eating better, improving relationships, or any number of other well-being factors. Therefore, take a moment to pause, reflect and appreciate where you’ve been and help it mold where you want to go. On a similar note, the DAHLC too, has seen changes over the past year. We want to take this time to highlight the top changes based on member feedback. 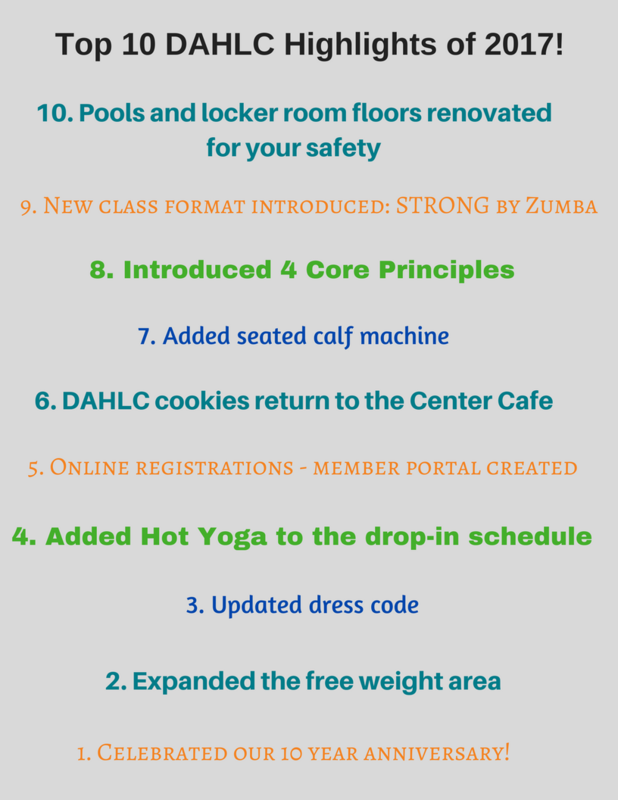 We are so thankful for these positive changes throughout our facility this year. We look forward to 2018!